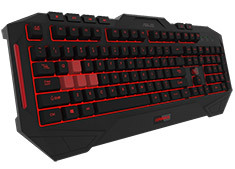 The ASUS Cerberus MKII Gaming Keyboard features durable 20-million-keystroke lifespan membrane switches. Multi-colour LED-backlighting provides you with up to three illumination modes that can be customized via an intuitive interface. You can also create macros and shortcuts for all keys. Cerberus MKII lets you program up to 12 macros for complex in-game actions or commands.